The end of the year tends to be a time for reflection and preparation. For me, it’s also a time to get yourself in gear. 2018 will soon be here and it’s time to figure out how you get to the next level. Y’all….it’s time to get creative. Goal setting requires creativity. It requires getting out of your rut and thinking about the world differently. I understand sometimes that’s REALLY hard to do with work, family, friends and episodes of Chopped (ok, the last one may be just me). Sometimes, having a prompt helps and here’s where the fun comes in.…. This December, I’m challenging myself to 30 days of creativity (I’m giving myself New Year’s Eve off). Each day, I’ll post a prompt and by the end of the day record what I did. I’m not going to limit myself to burlesque (although I think there could be a number of applicable tasks) – I want to stretch my creative muscles in all aspects of my life. And frankly, with what’s going on in the world – who *couldn’t* use a few new ideas? No censoring yourself – some of the work will be terrible. That’s more than OK. The goal is just to get something out there. Share the love! – ask your friends and family to participate also! Sounds interesting? 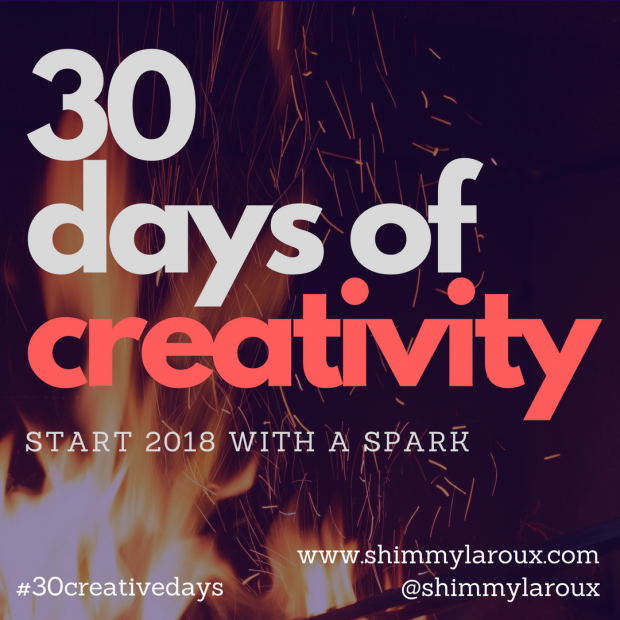 Then I invite you to join me in 30 days of Creativity! Post on Social Media what you are doing with the hashtag #30creativedays. Let’s see what you are putting out there and let’s create a spark in 2018!